Feb 23, 2007 in "Gran Fiesta Tour Starring The Three Caballeros"
Epcot's Mexico pavilion, "Gran Fiesta Tour Starring The Three Caballeros" debuts (replacing "El Rio Del Tiempo") with a new storyline and film featuring Donald Duck, José Carioca (the parrot), and Panchito (the Mexican charro rooster) from the 1944 Disney film "The Three Caballeros." 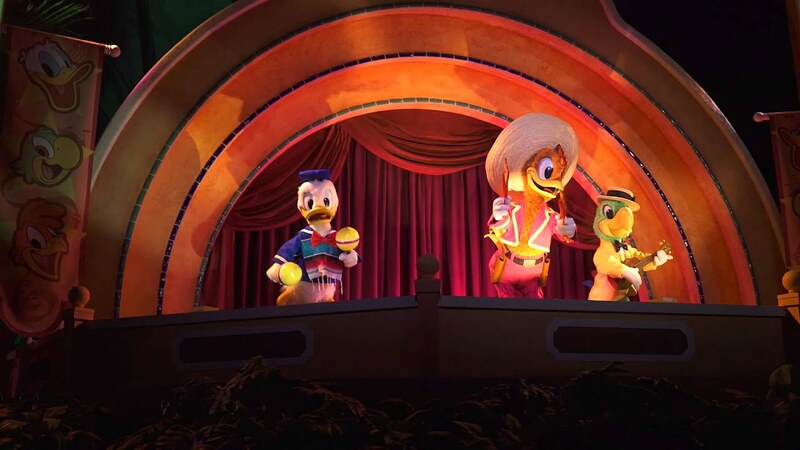 The "Gran Fiesta Tour" film features an animated overlay of the caballeros being reunited for a grand performance in Mexico City. Along the way, Donald disappears to take in the sights of the country, leaving José and Panchito to search for their missing friend. In addition to the new film, the boat ride's props, set facades and sound system have been refurbished and enhanced. The new attraction is set to open on April 2nd 2007. More from "Gran Fiesta Tour Starring The Three Caballeros"